My beloved Vicki is always cold. So I wanted to make her something that was fab-you-lous, and warm at the same time. This is a big knit using size 17 needles and a delicious strand of sequin mixed in with a lovely rope of yarn. This cowl has a swirling pattern up it. It is done in a repeat of 3 minus 1. By making it off by one, that allows the purl bump of the rib to travel up the cowl in a spiral. This yarn is pretty unusual. I got it at my FAVORITE knitting store. Orchardside Yarn Shop, in Raphine VA. Give them a call, and talk to Carole. Tell her you what you want to make, and she will ship out all the supplies you need. Gauge: 1.58 stitches per inch. Hold the bulky yarn with the carry along yarn doubled. Take both ends from the ball, pulling from the center and from the outside of the ball at the same time, and hold those together while you are knitting. Cast on 95 stitches. Join into the round being CAREFUL not to twist into a mobius loop. Continue in this pattern around. The purl will move one stitch over each round, creating a spiral. Finished scarf/cowl is 9″ wide, 60″ loop. Please do not dulplicate for distribution, sell or teach this pattern without permission. 6 years ago by Susi in Knitting , Knitting Projects , Needlecraft , Projects | You can follow any responses to this entry through the RSS feed. You can leave a response, or trackback from your own site. Absolutely gorgeous. What a wonderful way to start the New Year. Dang that is cute! Wonder how it would work holding together 4 strands of not bulky yarns? Maybe 5 strands? Becky, I don’t see how that would be an issue. It is already a stranded project. I know that when you hold lots of strands together, you are prone to get tangles as the yarn comes out of the multiple balls. So that would be the caution. But that is not in the knitting itself. I’ve used 7 strands at once to create a rainbow effect infinity scarf… I ended up taking the time to combine them together and create a new HUGE ball of yarn because, yes, strands coming from multiple balls tend to get tangled together… You spend just as much time untangling as you do knitting. 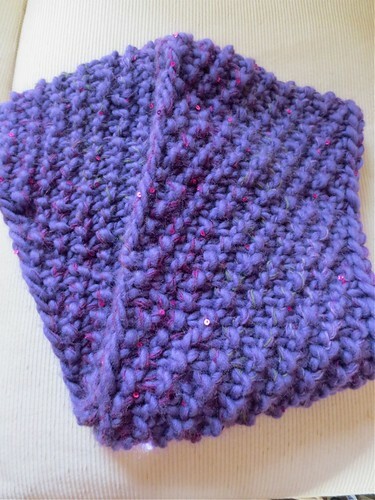 What a gorgeous cowl! I too have shopped at the Orchardside Yarn Shop. It was delightful. Such a picturesque setting, beautiful yarns and also some delicious teas and jams. A wonderful afternoonwas spent there. I’m going to try this pattern. Geri, I cannot believe you have been there!!! I knit with Carole when I was in High School! We go “way back’. You describe it beautifully. Thank you for sharing this lovely pattern. I want to make it for my daughter who lives in New England area. I am a bit confused. The picture of the round scarf does not look like a perfect cylinder. There is a shape coming out making it look like a pentagon when laid flat. Also, looks like there is some diagonal stitching? Can you please explain the pattern a little more to a novice like me. Thank you. Sheila, Thank you for the nice comments. The scarf is straight, and knit in the round. So in the picture, the scarf is folded on itself, and then folded in a “V”. Picture a long scarf that is attached on the short ends, so there is no short side to show you. 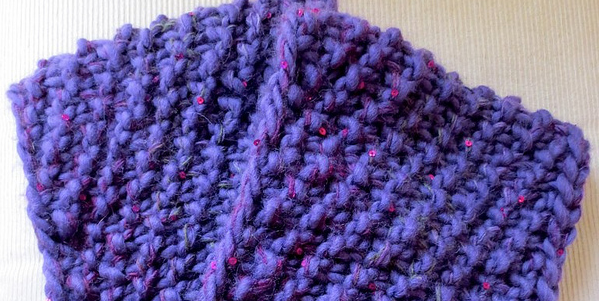 The seed stitch is making a diagonal pattern on the scarf itself. Think of a candy cane, where the cane is straight, but there is a diagonal stripe pattern running up it. That is an illusion to give the scarf some movement. I hope you have fun! And your Daughter loves it! Add the pattern to Ravelry! I would love to bookmark it for a future project – it’s beautiful! Have enjoyed talking to several people who have asked about yarns used for this project. 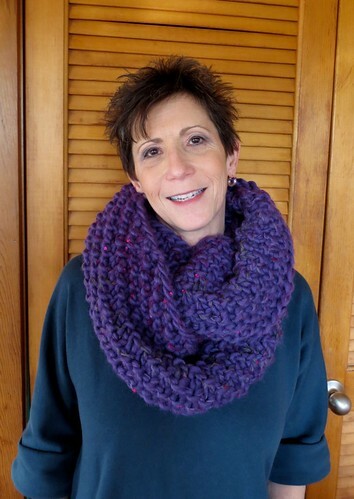 Thanks to Susie, we’ve sent out several packages of yarn and needles for her beautiful design and well written pattern. Beautiful Cowl, I have some Red Heart Vivid (Crazy Coral) to knit with, the carry along ball isn’t necessary is it ? Nivole, Thanks for your note! The carry along ball was just “extra special” “bling” but by NO means is it necessary. Send a picture when you are done, we would LOVE to see it! Hello! Is this scarf looped twice around the neck? Laura, The scarf is a LONG loop. And in the picture here, it is brought up and put around Vicki’s neck again. I hope you have fun!!! OK, I just figured out what the pattern actually is. Row 1 would be K2, P1. Row 2 would be P1, K2. Row 3 would be K1, P1, K1, etc. I think that’s what’s going on; correct me if I’m wrong? The purl moves up one on each row. I don’t know what they mean by 3 minus 1; that’s confusing. I hope someone pops up to clarify! I thought that this pattern would be great for a beginner like me (my second project), but the directions are incredibly unclear. I’m 4 rows into a nice, simple ribbed scarf, so I’ll keep going and finish it the way that I’ve been doing it. Maybe I’ll try again on another scarf. Mmee, I am so sorry the directions were not clear. It really is K2 P1 every row. And you don’t have to keep track of the rows, because you are knitting in the round. I just gave the detail of “a multiple of 3, minus 1” in case you want to change the size yourself. I cast on 95, (96/3=32 then take one away = 95) Because I used a number that is one less than a multiple of 3, the “rib” will move by one stitch each row. That said, I think this cowl will be beautiful in a rib! Ok…so I’m a little confused with the amounts of yarn being used. To clarify, I will have 3 strands that I am casting on with, Both ends of the chunky yarn and 1 end of the “carry along”? So I just used 1 strand of the bulky yarn, but I doubled the thin carry along. I did that because I wanted more sequins. : ) You will still be using 3 strands. But it will be much easier than two of the bulky together. I made this using Lion brand Hometown USA for my older daughter. Now my younger daughter, my son’s girlfriend and my older daughter’s friend all want one! I am working on my third scarf. So fast and easy! After the stitches are all cast on, your directions say join into the round. Does this mean to just start knitting? How do I join the ends when I’m done to make it a circle? Just stitch them together? Janine, GREAT! I think that doing a single cowl will actually show off the stitch pattern more effectively. Show us pictures when you are done! Could you use straight needles? Alice, The pattern is written for circular needles. You would have to modify the pattern to do “back and forth” in rows. And if you did it flat, you would need to seam it up. And the yarn is SO thick that (in my humble opinion) a seam would be unattractive. So, it would not be impossible. But it would create a lot of challenges. Hello. I WOULD LIKE TO KNOW WHAT NUMBER is the yard for this pattern? A friend just bought me a set of chunky circular needles as a present, and now I know what I’m making! 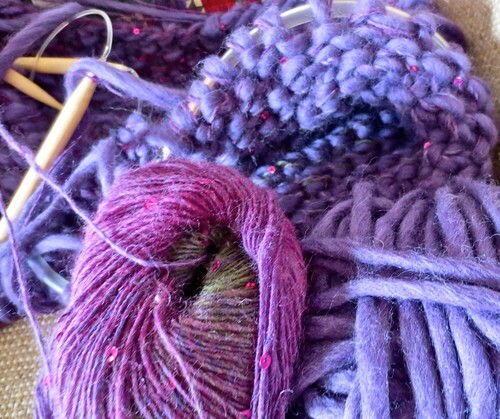 How many strands of DK would be needed to make up the right yarn thickness – 3? 4? Joy, I am so glad that you found us, and that this pattern caught your eye. I wrote a follow up article about color choices. But it needs to be said that the choices shown were 2 years ago. They may have changed some of their shades since then. Give Carole a call. Tell her Susi said hi! All the best in the new year! This yarn was really beautiful. And not scratchy. But this is not meant to be worn against the face for long periods of time. If needs be, it would work, but it’s not performance wear for skiing. that was my first concern because labels in clothing drive me bananas, never mind sequins around my neck. I found this pattern a while ago & am now on my third scarf! My college-age kids love them for walking around campus on a cold day–the can cover the lower half of their faces to ward off the cold. Nancy, I am so glad! How comforting that you can still keep your kids warm even though they are off at college. I would love to make this as a regular scarf. Am I right in thinking that I should make it a 3-row pattern?The first row being your as written, the 2nd row: K1, P1,K2…..repeat. Row 3: P1, K2, ….repeat. Continue with rows 1-3 to desired end. I would probably cast on a lot of stitches and make the rows lengthwise.. I think that would work. Just wondering if any one has done it that way. When you say K1 P1, do you mean you knit one row and then purl the next row? Or do you you mean in the row you knit one stitch and then purl the next stitch? I would like to try this but I’m a beginner knitter so I’m kind of nervous about doing anything other then garter stitch. This means within the same row you knit two stitches and then purl one stitch. You continue in that pattern around the whole row. This should be a great beginning project for you!